Three majestic volcanoes lie just south of Lake Taupo, towering over the lake like ancient guardians…. Climb aboard a thrilling ride down Australasia’s biggest rapids – the churning, ferocious Aratiatia Rapids. Hold on tight as you spin 360-degrees, speed through narrow canyons and river whirlpools and get airborne! Huka Jet takes adrenalin-seekers to the thundering mouth of Huka Falls – New Zealand’s most visited natural attraction. One of the most exciting and memorable ways to see the beauty of Taupo is strapped to a Parachute! You can Sky Dive Tandem or Solo and have your experience caught on film. Freefall until your chute opens then soar like an eagle over Taupo’s lake, town, rivers and lush forests. The white water rafting experience can be a peaceful drifting trip on the Tongariro or a paddle-gripping white water challenge on the Mohaka for the adventure seeker who needs the thrill of blasting down endless rapids at a romping pace. The Tongariro river is known as the perfect river for your first rafting experience. Float past ancient beech forests, through gorges, past limestone and volcanic cliffs and then race down 50m 'roller coaster' rapids at exhilarating speeds. Rick and Linda can recommend or help you to select from the many tour operators in the region who offer day trips. It’s a great way to see wilderness country inaccessible by road. An authentic New Zealand experience! Take the plunge and try the extreme sport of Bungy Jumping in the country that invented it! 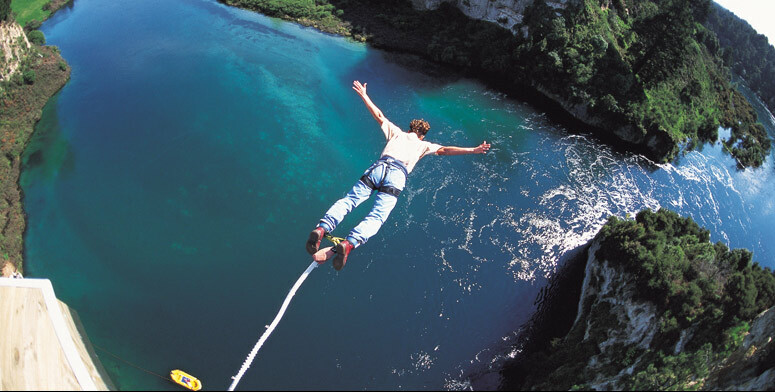 Taupo Bungy is considered one of the world’s most stunning Bungy Jump sites, you’ll leap off a platform high above the swirling Waikato River (the colour of the water is amazing) with a bungy cord strapped around your ankles – a bit like a Human Yoyo! You can Bungy Jump by yourself or strapped together with your friend or partner in a Tandem Bungy! You can even choose whether or not you’d like to be able to be dunked in the water at the bottom of the jump.